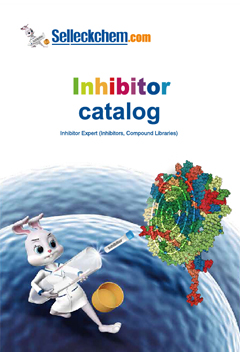 AEE788 (NVP-AEE788) is a potent inhibitor of EGFR and HER2/ErbB2 with IC50 of 2 nM and 6 nM, less potent to VEGFR2/KDR, c-Abl, c-Src, and Flt-1, does not inhibit Ins-R, IGF-1R, PKCα and CDK1. Phase 1/2. EGFR-SGLT1 interaction is irresponsive to modulators of EGFR’s tyrosine kinase. A: Immunoprecipitation coupled Western blot analysis ofinteractionsbetween EGFR-HA and SGLT1-FlaginHEK293 cells treatedwith EGF or AEE788. EGFR, total EGFR; pEGFR, phosphorylated EGFR; IP, immunoprecipitation; IB, immunoblot. Input, expression levels of indicated exogenous proteinsin HEK293 whole celllysates used for the IP. The Prostate, 2013, 73:1453-1461.. AEE788 (NVP-AEE788) purchased from Selleck. The in vitro kinase assays are performed in 96-well plates (30 μL) at ambient temperature for 15–45 min using the recombinant glutathione S-transferase-fused kinase domains (4-100 ng, depending on specific activity). [γ33P]ATP is used as phosphate donor and polyGluTyr-(4:1) peptide as acceptor. 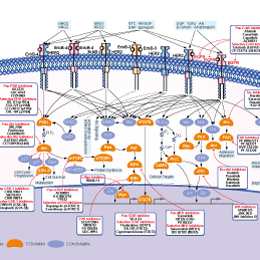 With the exception of protein kinase C-α, cyclin-dependent kinase 1/cycB and protein kinase A are protamine sulfate (200 μg/mL), histone H1 (100 μg/mL), and the heptapeptide Leu-Arg-Arg-Ala-Ser-Leu-Gly (known as Kemptide Bachem) respectively and are used as peptide substrates. Assays are optimized for each kinase using the following ATP concentrations: 1.0 μM (c-Kit, c-Met, c-Fms, c-Raf-1, and RET), 2.0 μM (EGFR, erbB2, ErbB3, and ErbB4), 5.0 μM (c-abl), 8.0 μM (Flt-1, Flt-3, Flt-4, Flk, KDR, FGFR-1, and Tek), 10.0 μM (PDGFR-β, protein kinase C-α, and cyclin-dependent kinase 1), and 20.0 μM (c-Src and protein kinase A). The reaction is terminated by the addition of 20 μL 125 mM EDTA. Thirty μL (c-abl, c-Src, insulin-like growth factor-1R, RET-Men2A, and RET-Men2B) or 40 μL (all other kinases) of the reaction mixture is transferred onto Immobilon-polyvinylidene difluoride membrane, presoaked with 0.5% H3PO4 and mounted on a vacuum manifold. Vacuum is then applied and each well rinsed with 200 μL 0.5% H3PO4. Membranes are removed and washed four times with 1.0% H3PO4 and once with ethanol. Dried membranes are counted after mounting in a Packard TopCount 96-well frame and with the addition of 10 μL/well of Microscint. IC50 values (±SE) are calculated by linear regression analysis of the percentage inhibition and are averages of at least three determinations. Method: Methylene Blue Cell Proliferation Assay.Cells are seeded at 1.5 × 103 cells/well into 96-well microtiter plates and incubated overnight at 37 °C, 5% v/v CO2 and 80% relative humidity. AEE788 dilutions are added on day 1, with the highest concentration being 10 μM. After incubation of the cell plates for an additional 4 (T24) or 6 (BT-474, SK-BR-3, and NCI-H596) days, cells are fixed with 3.3% v/v glutaraldehyde, washed with water, and stained with 0.05% w/v methylene blue. After washing, the dye is eluted with 3% HCl and the absorbance measured at 665 nm with a SpectraMax 340 spectrophotometer. IC50 values are determined by mathematical curve-fitting and are defined as the drug concentration leading to 50% inhibition of net cell mass increase compared with untreated control cultures. Traxler P, et al. Cancer Res, 2004, 64(14), 4931-4941. Park YW, et al. Clin Cancer Res, 2005, 11(5), 1963-1973. Yokoi K, et al. Cancer Res, 2005, 65(9), 3716-3725. Meco D, et al. Transl Oncol, 2010, 3(5), 326-335. Yu C, et al. Clin Cancer Res, 2007, 13(4), 1140-1148.